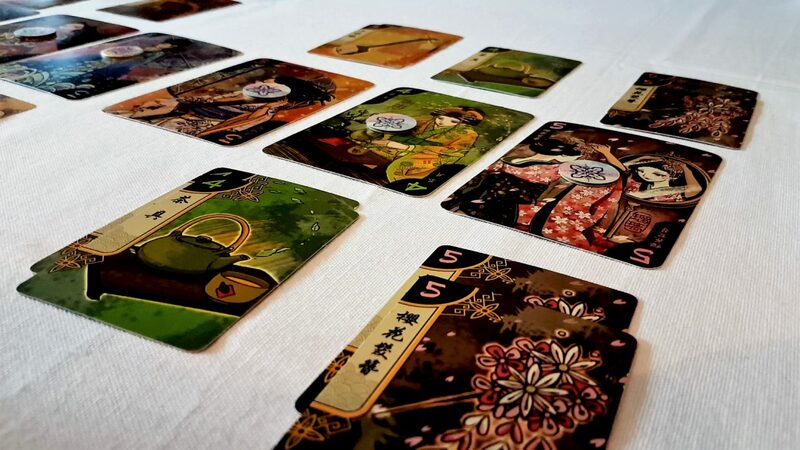 We’ve been playing Hanamikoji for three rounds. We’re both roughly even although perhaps the momentum is on my side for the moment. I’m staring at a hand of the beautifully illustrated items with which I am attempting to lure equally beautifully drawn geisha to my restaurant. I’m staring at the geisha. I’m staring at my hand. I’m contemplating my options. I’ve been doing that for a solid minute now. I come to a decision. I regret it instantly. I return back to my contemplation. Thirty seconds later, I let out an animal roar of frustrated despair before handing Mrs Meeple what I think is the dream opportunity of which I am convinced she’s been dreaming. She stares at the cards I have offered her. She stares at the geisha. She goes silent. A minute later she gives out her own anguished wail and picks up the one card I thought she’d never want. You only ever take four actions in Hanamikoji. Those actions might lead to the four hardest choices you ever make in any game you ever play. There is nothing that is in this box that would suggest for a moment you are going to find playing it such an emotionally draining experience. Like a kind of cardboard Adam Jensen, I spent my first game of Hanamikoji murmuring ‘I didn’t ask for this’ under my breath. I was looking for something light and breezy. 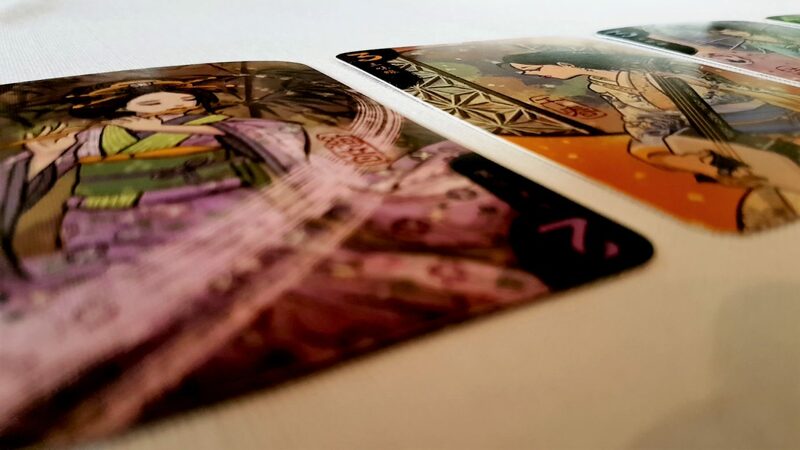 Hanamikoji is for two players, lasts around fifteen minutes, and takes the form of a handful of gorgeously illustrated cards and a few tokens. It looks impossibly charming – whimsical, even. When I was setting it up for the first time I thought to myself – not for the first time – that it’s a crime that you can’t often buy board-game illustrations in wall-art form. This is a game with cards that I would hang from my wall. Geisha in the proper sense. Get your mind out of the gutter. There’s nothing in the rules either that immediately raises alarm bells that you are about to enter a psychological charnel house. You lay out the cards that represent the geisha, arranging them in a line from lowest value to highest. The numbers on the cards indicate how many of their matching items are to be found in the draw deck. Much like with Schotten-Totten your job here is to claim influence over a shifting battleground of opportunities. You need to play the largest number of the cards that belong to an individual geisha to recruit her to your establishment. To focus on one is to risk the others. The five-value geisha is worth a lot of points, but she also has a lot of cards in the deck for which you’d need to account. The two value geishas may not be worth much individually but their services can be locked down comparatively easily. You win if at the end of a round, in the final accounting, you control four geishas or eleven points worth of geisha. They don’t look like it, but these are the focus of your life now. Oh, but there’s a catch – there is such a catch. Such a delicious, marvellous and beautiful catch that it will drive you to despair. In every round of the game you have four actions you can take. You can take them in any order, but you can only take them once per round. The actions are very simple. You can trash two cards from your hand – get rid of them, they’re not in play this round. 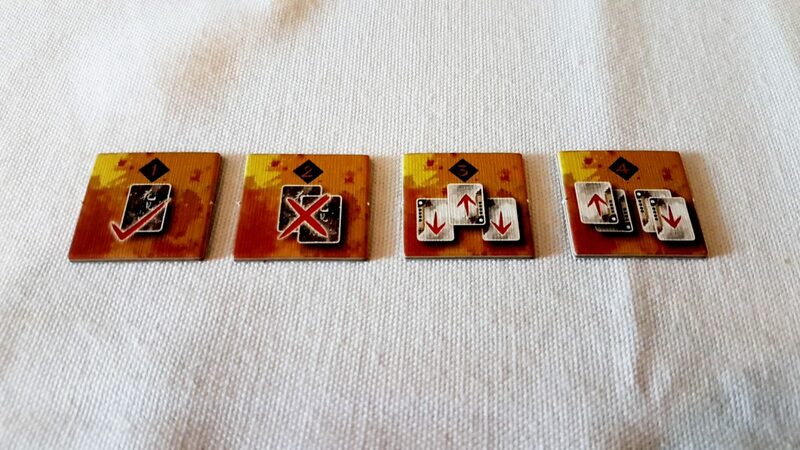 You can place a card as a secret – a face down ambush that will get played to the tableau when you and your opponent have finished your actions. You can make a gift, where you lay out three of your cards – your opponent plays one to their side of the board and you play the other two to yours. You can offer a competition, laying out two pairs of cards – your opponent gets one pair, you get the other. Have you noticed something about those actions? Here is the most significant aspect about the whole thing – none of these actions let you simply play a card from your hand to the tableau. The best you can do is play a card that will be revealed at the end of the round at which point it might turn out to be utterly useless. In all other circumstances in Hanamikoji you play the cards that your opponent leaves you from the choice you give them. This is a major feature of how you play the game. 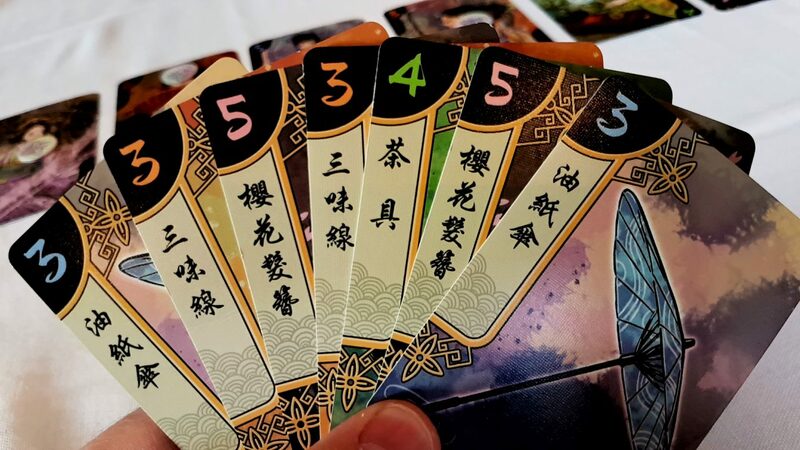 The outcome of the action set is that you read the rules and cheerfully sit down with your first hand of seven cards only to realise – this is really bad. You each have a hand of six cards at the beginning of the round, and this gets supplemented with an additional card each time it’s your turn. One card from the deck is always removed at the start – it gets secretly burned so nobody can play it or even know what it was. You look at your hand of cards. You look at your options. You look at the geisha arrayed before you. ‘Oh’, you say. ‘Oh no’. You’ll stare intently at those cards. You’ll become intimately familiar with the possibilities they make available for you. Don’t worry, this initial uncertainty will rapidly give way to a fuller, more rounded and more comfortable appraisal of your situation. ‘Oh God no’, you’ll say. This is Hanamikoji – it is glorious. Every single turn you’re compelled to engage in an act of self-harm. The only saving grace is that your opponent is facing equally terrible decisions with equally significant consequences. Neither of you will be happy with anything you do, and yet somehow neither of you will be happy with anything your opponent does either. Look at the hand of cards above. Just look at it. Two fives are pretty great – that gives you a really good chance to claim the most valuable geisha. But there are still another three of her cards out there – maybe in the draw deck, maybe burned and in the box. Maybe though… just maybe… they’re in the hand of your opponent. Risky, risky – but you do have the two orange threes, as well as the two blue threes. Those geishas are yours if you want them, right? And it’s then you really understand the sting in the tail of this lovely little game. Every single action you can take is a trap that you yourself set before stumbling merrily into its jaws. Remember the only way you can play a card directly to your side of the table is to place it as a secret. Every other action you have is either discarding cards from the game or giving your opponent a chance to play one or more from your offering. How exactly are you going to get those fives into the tableau? How do you give your opponent a choice of three cards in a gift and get them to take the one that’s least valuable to them? How do you let them pick between two pairs in a way that leaves you with the pair you want? It’s the philosophy of a magic trick with none of the tools you’d need to pull it off. When a magician offers you a card, you’ll end up picking the one they wanted you to pick. In Hanamikoji the only thing you can do to assess an opponent is to try to and directly read their mind. That is an unreliable strategy, although somewhat overpowered if you can pull it off. We don’t need to worry about that right now. Let’s say we take one of those fives from our hand and play them as a secret. We can make this a problem for the future. After all, competition over the most valuable geisha will be intense and it doesn’t hurt us to have a horse in that race. And now we’ll get to decide our next action on what we suspect of our opponent’s intentions based on what cards they offer us. Nope, they played a secret too. Of course they did. 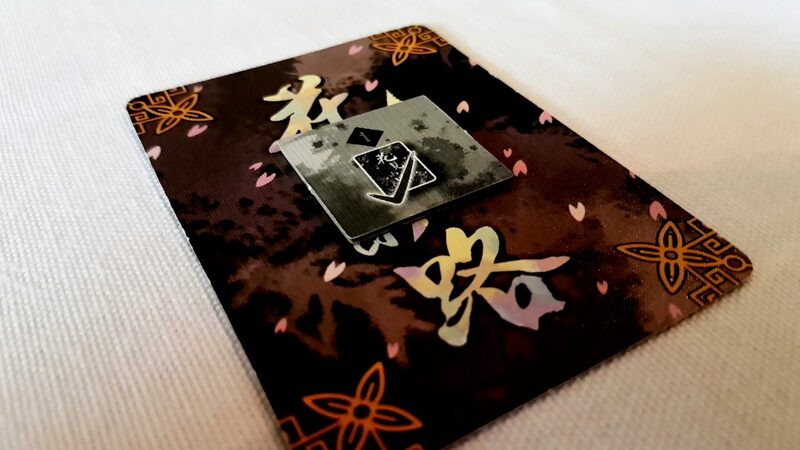 So now we’re both committed to a card on a geisha we might not even be able to claim. It’s like being back where you started except everything is somehow worse and more difficult. Now you’re either making discards or making an opponent happy. At least, that’s how it appears on your side of the cards. You’ll be making life difficult for your opponent sooner than you might think. I got you a present! I hope you choke on it! Nothing here is good for you so you give in to inevitability and make a gift. Like the world’s most passive-aggressive Santa though you try to make it obnoxiously difficult for the recipient to appreciate your generosity. Say we offer a five and two blue threes – our opponent here can take the five and make progress on that card, but in the process they outright gift us the blue three. They could take one of the blue threes, which would at least ensure they had a chance of claiming that even if they give up the five in the process. The thing is, you think you gave them an irresistible present but they just see it as a slightly less grim version of Sophie’s Choice. Pick any pair you like, but if it’s the one I wanted I will physically strike you. And they’ll do the same to you. They offer two pairs, but why those pairs? Which one are they trying to make you pick, and why? Is it just shallow damage mitigation, or can they actually stop you getting what it seems they have just merrily granted you? Perhaps they’re looking to sweeten the pot later for when they make a gift of their own – offer you a delicious morsel now in order to force you to make a difficult decision later. You don’t know. You just don’t know. It’s hard to make an offering in Hanamikoji but that’s nothing compared to how difficult it is to accept one. You’re forever juggling the requirement to gain the favour of a geisha against keeping your relative position on the ones you’re already courting. 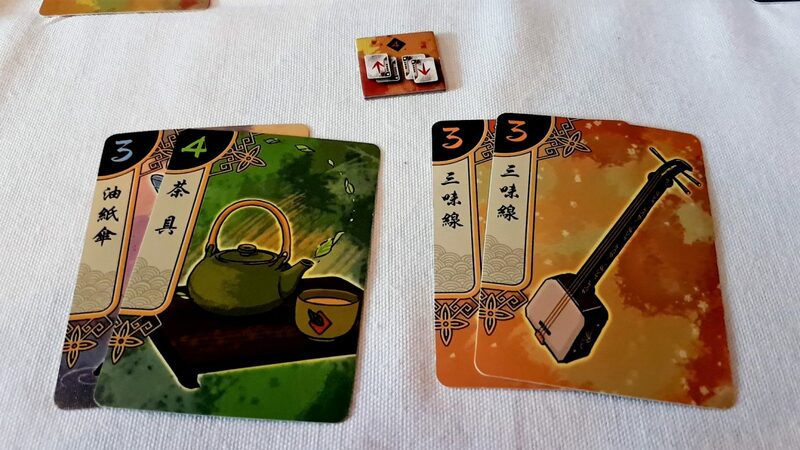 You just need to have made the largest effort to win a geisha’s favour – one card on the five geisha is all that’s needed if your opponent neglects the opportunity. So perhaps that’s what they’re doing so as to lock up the others. Perhaps they want you to over-commit. Or perhaps they want you to think they want you to over-commit. The best way to think about this is that your job isn’t to ensure a fair distribution of cards. Your job is to present your opponent with an impossible dilemma that means you’re going to come ahead regardless of what they choose. That puts a phenomenal burden of responsibility on you, and you’re just trying to pay that forward. 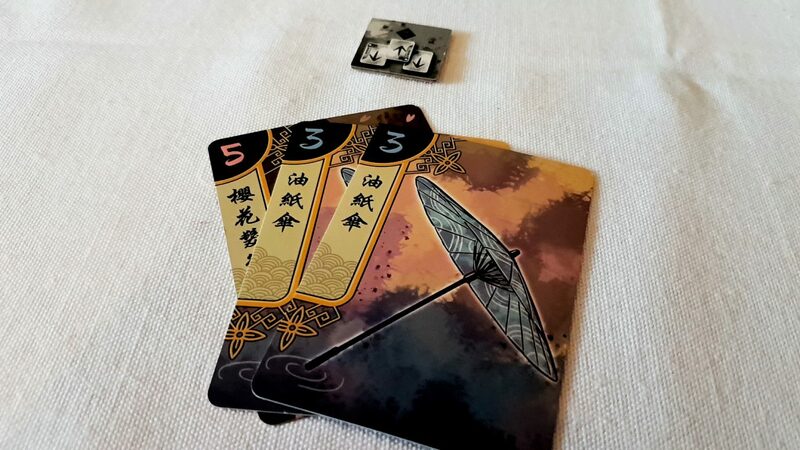 The worst thing in a game of Hanamikoji is when your opponent scoops a card from your gift without thinking. That means you messed up. You want them to groan when they unwrap your presents, and you want them to accept them with the good grace of a ten-year old that finds socks instead of an Xbox under the tree. There are many things that define how good a game is. One of the most important, at least in my view, is that a good game gives you opportunities to make interesting decisions. In that respect Hanamikoji isn’t good – that’s too parsimonious an adjective. The decisions with which you are presented make this an excellent game – these are decisions that are deceptively simple but deceitfully difficult. They’re impactful. They are psychologically costly to make. Every time the spotlight comes your way you’re facing an exquisite agony. This isn’t like Five Tribes where the decision space is so large that you need to learn the brutal efficiency of intuition as a self-preservation strategy. You won’t get lost here but each instance of the possibility matrix is a stepping stone that has risen out of some incredibly deep and treacherous waters. One slip of the foot, and you’re gone forever. It’s so tricky to accomplish the goals of Hanamikoji in fact that most rounds of the game end without anyone claiming victory. 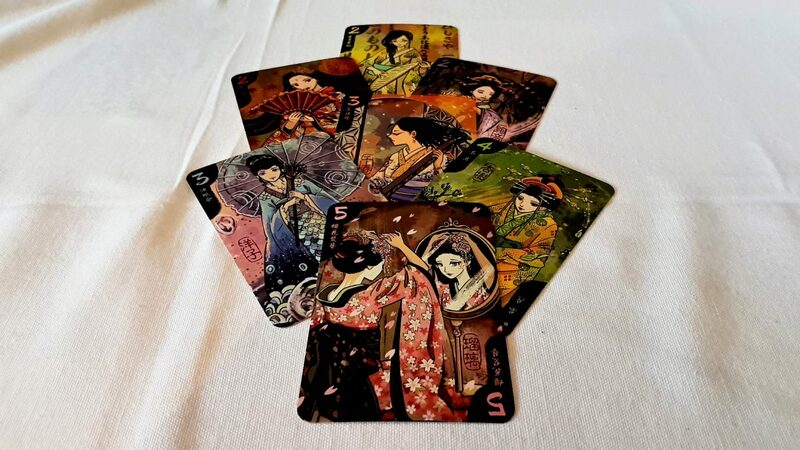 At that point the next round begins – all the cards are shuffled and dealt out again, but the victory markers that represent influence over geishas stay exactly where they were. In the event claimed markers don’t change during the next scoring phase, they’re still counted towards a player’s total even if they didn’t play a single card that round. Thus the puzzle gets simultaneously easier to approach and more turbulent in its energy. Simply denying someone a previously charmed geisha can be reason enough to play a card even if you have no intention of actually winning it. The equilibrium of play shifts, but it never topples. This is a game of remarkable balance. I hate to do a review that is unabashedly positive. Part of the job a review has to do is to be meaningfully critical. It should point out flaws because those are important in a full analysis. I can’t make up problems that don’t exist though. 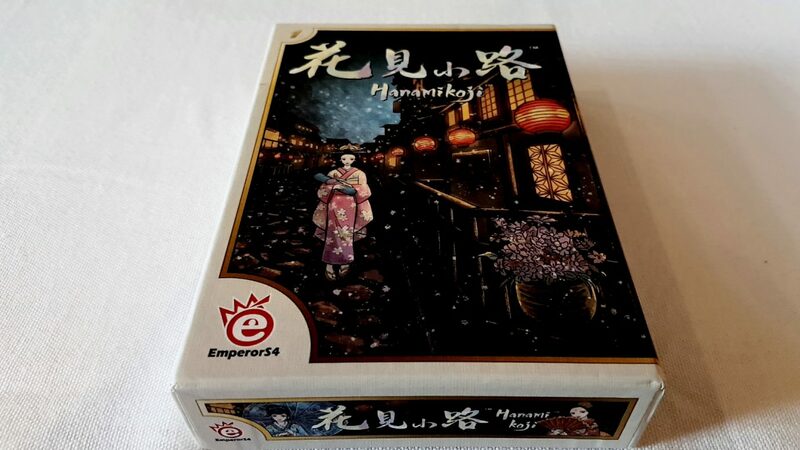 Hanamikoji is not flexible enough with player counts and player personalities to be a truly perfect game, but it’s a pretty perfect implementation of what it sets out to be. I bought this game on a whim. I expect it to be on my shelves for the rest of my life. If you’ve got any sense at all, you’ll rush out and pick up a copy at your first possible convenience. And maybe even a bit before then since it seems like it’s somewhat hard to get at the moment. Even in its limited availability it is very Hanamikoji. I have offered you my enthusiasm as a gift, but it turns out in the end it’s not quite as straightforward an offering as you might have hoped.